An achievement (or heraldic achievement) is a full display of all the heraldic components to which the bearer of a coat of arms is entitled. It includes not only the “coat of arms” design on the shield, but also a number of other components (e.g. a crest, torse, mantling, helm, coronet or crown, supporters, motto, and sometimes the symbol of an order) as seen in this diagram. The terms “coat of arms” and “family crest” are often mistakenly used to refer to the full “heraldic achievement”. A coat of arms is actually just the design on the shield (aka “escutcheon”). They were also often displayed on coats used to cover and protect armor and to identify the wearer, hence the term “coat-armor” or “coat of arms”. Each design is unique to an individual family, organization, or state, and may include a combination of abstract elements as well as a wide variety of plants, animals or other icons. A crest is the component of the “achievement” which stands on the “crest” of the helmet. They typically depict an animal (quite often a lion), arms holding weapons, bird wings, fans of plumes, pairs of horns, etc. Crests were originally made of painted metal or leather and actually worn on top of the helmet. The clan crest badge traditional in Scotland borrows some of the items from the full acheivement above; the crest, the wreath (and or crown, cap, coronet etc) and the motto. It was tradition that a clan chief would issue his followers with a metal badge of his clan’s crest. This was attached to the clothing by means of a leather belt. When the badge was taken off the belt would be coiled around it and this has formed the origin of the Scottish crest image today. Ever since medieval times there has been a long proud tradition of highly skilled wood carvers producing awe-inspiring carvings of heraldry, or “heraldic art”. These artisans use hammers and chisels (often supplemented by painting) to create carvings that cannot be rivaled in character or authenticity by today’s computer-aided techniques. Perhaps the pinnacle of perfection in this art form in current times has been achieved by Englishman Ian Brennan, who is the official sculptor for the most prominent Knight Orders as well as British royalty. See http://www.heraldicsculptor.com/woodcarver-ian-brennan.htm for photos and information about him and his work. See also the links at the bottom of this article to several other traditional wood carvers who specialize in heraldic art today. Despite their undeniable appeal, traditional hand carvings of coats of arms (much less full “heraldic achievements”) are time consuming and expensive. That’s where computer aided methods offer a major advantage. Our company, eWoodArt.com, specializes in computer assisted design and production of wood carvings of custom designs and artwork furnished by (or created on our site by) our customers. We happen to focus on carvings on wine barrel heads, which have their own special appeal to wine lovers and wine-oriented businesses, but there’s no real limit on the specific wood medium used for these carvings. Shown below are a few select examples of coat of arms and achievement barrel head carvings in different carving and finishing styles. You can see other examples in our growing coat of arms gallery page . The example to the left below is a 3D relief carving of a composition of coats of arms of three families that founded the Ferraro Ristorante chain. We made the composition from several different 3D models available from one of the leading suppliers of 3D artwork for use in computer-assisted (aka CNC) carving, and then projected combinations of other 3D and 2D artwork onto the shields. The customer wanted us to make the piece look hundreds of years old, like a photo he supplied to us, so it is heavily distressed and antiqued. The example in the middle is another barrel head carving which incorporates some elements of a full achievement in 3D relief, together with an elaborate 3D border carving (and 2D text carvings) to set it off. The customer had no known family crest or coat of arms, but really liked the concept and the look. So we developed 2D artwork of a big celtic style letter “A” and projected it onto the 3D shield – voila his own family crest. Unlike the highly distressed and antiqued piece to the left, this one is finished like a piece of fine new furniture. 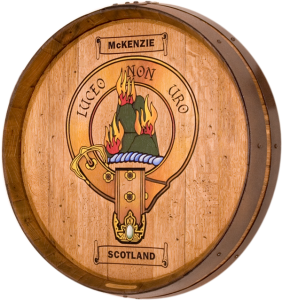 The example on the right above is a scottish clan style crest, carved in the “2d” style – i.e. black areas V-carved with other areas flat planer areas. In this example the crest elements were painted by our very talented artist with subtle color gradients and shadings. Finally, here is a very modern, whimsical and somewhat irreverent take on the coat of arms motif. One of our customers wanted to make a strong personal statement for display in his new wine cellar – a barrel head carving of his very own highly customized coat of arms. He wanted it to depict his favorite passions and pastimes, including his sport teams, music, beach, wine and pizza, all revolving around a central theme of love. We worked together with him to create (and find) suitable artwork from a variety of sources and composed them on a shield. The highly detailed 2D artwork is meticulously carved and hand painted, and the piece is finished to a fine-furniture grade look. The result is truly unique and stunning, and the perfect conversation piece around a nice bottle of wine in his cellar. At eWoodArt.com we routinely use both 3D & 2D carving techniques, and combine them in different ways on our barrel head carvings and other products depending on our customers’ input and budget. For more information on 2D vs 3D artwork and carving see this article. If you want to dive deeply into the history, meanings, origins, legalities and nuances of heraldic art we highly recommend the excellent and scholarly discussion at www.internationalheraldry.com. The following information on authenticity and legality is paraphrased from them. In countries where heraldic practice is governed by law there is a distinction between arms that have been formally granted and those that are simply adopted by the user. In the past using adopted or “bogus” arms could invite legal action, and “heralds” used to seek out, identify and destroy these bogus arms. In practice, proof of continued use over a number of generations would qualify the users and the heralds would regularise the usage. Today only Scotland enforces their use in a rigorous manner. In most countries there are no rules about using coats of arms, and people are free to adopt them for their own use. Even in countries where there are no formal rules, it is still useful, if perhaps a little artificial, to distinguish between “real arms” and “bogus arms”. Real arms are registered with a competent authority who can at least ensure uniqueness and good heraldic practice. So ..if you are a purest about your claim on a particular crest or coat of arms, or if you live in a country that is (e.g. Scotland), you should know that it may be illegal, or at least considered poor form, to use a coat of arms which is not assigned to your ancestors. A common misconception is that a coat of arms belongs to all members of a family with a common surname. That is not the case, though there are many companies that will sell you heraldic art that they claim or imply you have a right to. Our philosophy is to inform our customers of this issue, and let them decide how much liberty (if any) to take in this matter.